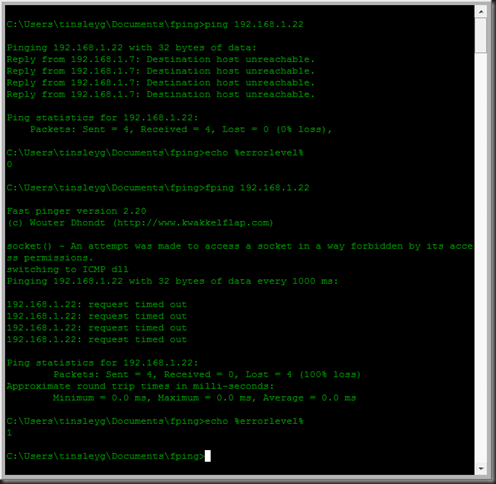 So the windows version of ping is really stupid. I was writing a batch script to mount up a network share that involved checking to ensure my NAS unit was turned on. The script is scheduled to run after the computer resumes. What I found out is that the built in version of Ping.exe is terrible at telling you whether the ping has returned successfully or not. 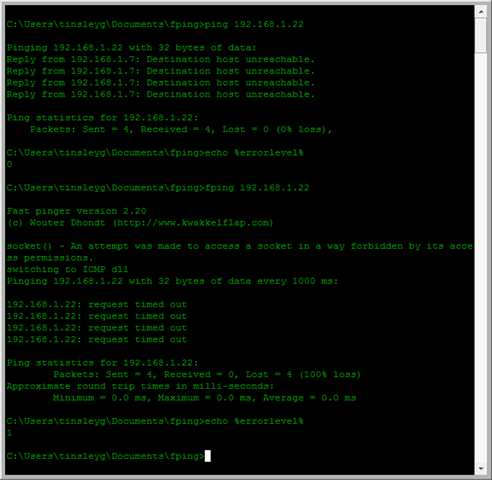 I was checking the ERRORLEVEL – %ERRORLEVEL% variable to find out what ping was returning. It should be 0 for success and 1 or higher for a failure. What I found was, i was getting replies from the local pc (dunno why, leave me a comment if you know) and ping was reporting a success even though the correct pc failed to reply. The solution? Replace the Windows ping.exe with Fping. It has a lot more options and appears – from some initial quick tests – to correctly report the errorlevel. Kudos to Wouter Dhondt for developing it. I’ll update this post with any more news! This entry was posted in Internet, Uncategorized and tagged Internet, software, tips, tools on August 25, 2010 by garreth.